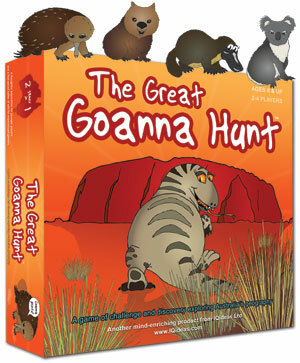 Riding on the success of The Amazing Moa Hunt and The Great Goanna Hunt, we turned our attention to world geography. For The Amazing Mammoth Hunt there were a host of key changes that make it, to me, the best of the three ‘Hunt’ games. Firstly, we went to a huge, gorgeous 3-fold board to properly display the globe and we moved to a maximum of 6 players. For the first time I really got to sink my teeth into the original rules and add some elements that increase both the excitement and the playability of the game. I introduced Mammoth money which allowed players to buy clues from a clue sheet that would help narrow down where countries were located. By different amounts of Mammoth money to players at the start of the game, you can balance it when playing with people of varying geographic knowledge- great when playing with kids, or if the adults are (ahem) clueless! The ability to steal tokens now became a challenge, allowing the potential victim a chance to avoid the loss. That became even more important with the addition of a Mammoth token which was worth 3 big points at the end of the game. There were a raft of other small refinements that allowed the game to play even more smoothly. There’s even a fun constructible dice tower to stop dice scattering across the table! Bek’s graphic work was again fantastic, but we also both feel that her idea of using native animals as the icons of each country worked incredibly well. Kids especially grasp the idea of the panda representing China, the kangaroo for Australia or the tiger for India. Even if their geography was tenuous, these animals helped them build a framework for learning about the world. I’ve played the game with a range of adults and kids and it’s fabulous seeing them realise that they should keep the tokens they’ve won face down to protect the higher point ones, or glomming to the idea of watching someone else reveal the wrong country and then trying to land on it to claim it. One of my favourite sessions was with a group of at-risk secondary kids- it turned out their teacher’s speciality was geography, and he’d never seen them so excited about the subject! 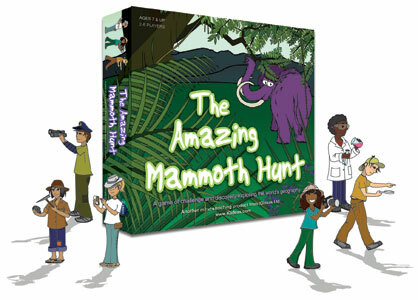 There’s more on The Amazing Mammoth Hunt at IQ Ideas. Nectarine built, hosts and maintains my website: gainmomentum.co.nz. I started my business small and have grown exponentially in the 16 months. During that time, Minty and Bek of Nectarine have helped at every turn. They have been efficient, tolerated my technophobia, and produced a dynamic website, amazing advertising campaigns and provided invaluable advice. I have no hesitation in wholeheartedly recommending Nectarine to other business owners! Nectarine was like a genius in classy armour riding a horse, coming to our rescue from our fear and procrastination about creating a website. Minty and Bek arrived with a camera and despite our lack of clarity, not only created a fantastic website but also loaded photos on it for all our different pages. It was such a relief to be guided and then carried into our website as we trying to get organised with the rest of our business. We continue to get great feedback on the design of the site and the friendly image Minty and Bek created. Bek has the mind of a tack, sharp, clear and precise and Minty makes everything accessible and fun. Their knowledge combined certainly creates a well oiled and polished beautiful machine. Its seldom that technical skills and design come together in such harmony. Thanks for saving us!! !